Pamela Bridgewater: Our Manifest Destiny? A tongue in cheek piece ‘connecting the dots’ between the arrival of the US Ambassador to Jamaica and a bizarre sequence of events. From time to time I like to undertake what i call ‘Dot connection exercises’. For instance I couldn’t help but notice the sequence of events that preceded and followed the sensational charges recently levied against JLP Deputy Leader James Robertson. Can we read a pattern here? 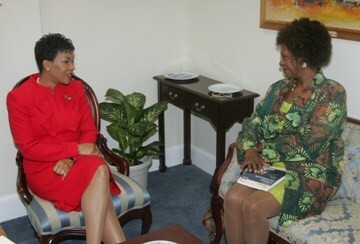 Arrival of newly appointed US ambassador to Jamaica, Pamela Bridgewater. In her inaugural speech she announces her determination to fight corruption in Jamaica. Someone spraypaints PNP graffiti all over the JLP stronghold of Tivoli Gardens. In the days that followed speculation was rife as to who could have marked up the fortress of Tivoli in this manner; was it the residents themselves? was it the Police under whose watch the outrage had occurred? “The one thing that I will dismiss is that the graffiti that was painted here was done by duppies from over the May Pen Cemetery,” Mr. Golding was reported by the Gleaner as saying. The Sunday Herald publishes allegations that Deputy Leader of the JLP, Senator James Robertson, took out a contract on the life of Ian Johnson, a loyal activist for the Labour Party. Everyone immediately starts casting aspersions on Johnson’s mental health. Why? A crazy person can’t be targeted for murder? Remember the saying Just because you’re paranoid doesn’t mean they’re not out to get you. Just saying… For reasons unknown, Clovis the Observer cartoonist has not yet produced a cartoon depicting this situation. Montego Bay Mayor Noel Donaldson writes to Prime Minister Golding saying he has recieved death threats from within the Jamaica Labour Party (JLP). He believes that Horace Chang interests are menacing him for supporting rival Christopher Tufton in the party’s leadership race. Olint boss former foreign exchange trader David Smith was flown from a Turks and Caicos prison to to the US to face 24 charges against him. Pleads not guilty. On the same day the JFJ (Jamaicans for Justice) calls on govt to correct 100 human rights abuses. 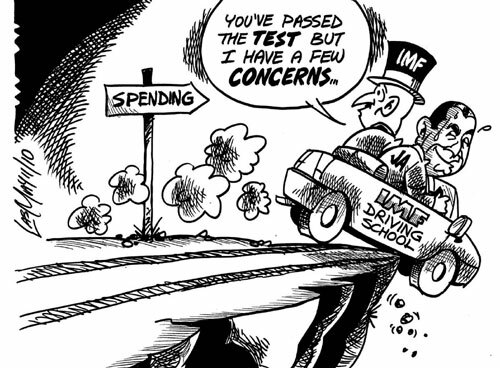 It is announced that Jamaica has passed the next IMF test though a rocky road is predicted for the future. The last time Jamaica passed an IMF test was in May just before the Tivoli invasion and right after Bruce Golding announced his willingness to hand over Dudus to US federal authorities. 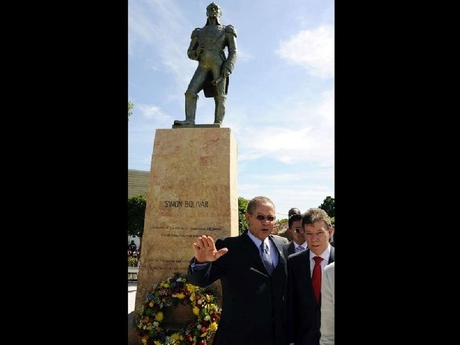 President of the Republic of Colombia, Juan Manuel Santos Calderón, hopes the strategies his country used to fight the drug cartel in his country will be of benefit to Jamaica’s crime problem. What next? And do you, like me, detect the hand of the Americans behind all this? Could this be our Manifest Destiny? Is the US just cleaning up its backyard?